Power drills are some really versatile, durable, and useful tools; they are great for many jobs and screwing in a screw or drilling holes is definitely made much easier with the miracle of electricity. However, there are hundreds of different options out there and not all of them are up to par. We want to help you find a really good simple, inexpensive, and reliable drill. If you need a good drill, you might want to take a closer look at the SKIL 6335-02 Corded Drill. Ok, so the SKIL 6335-02 Corded Drill is not really a new drill; it has been around for a few years now, but this does not really mean anything. It is an upgraded version of a couple of old corded SKIL drills, but at the end of the day, it is a normal corded drill. It is a basic corded drill that can be used for all kinds of drilling and screwing purposes. Because it is a corded drill, you don’t have to worry about battery packs, which is always nice. If you are just doing normal drilling, the SKIL 6335-02 Corded Drill might be the right tool for you. More or less, if you need a drill to make holes and put screws in things, the SKIL 6335-02 Corded Drill might be the drill for you. We know this sounds kind of dumb, but the fact of the matter is that it is just a good basic all-around drill. It is a corded drill, so if you are handyman that needs it for the jobsite, you will need an extension cord, but it works just fine nonetheless. It is actually a really durable and rugged drill, so it will fare well on the jobsite. With that being said, it also makes a good drill for simple at-home use. It’s just a good drill that gets the job done. When you purchase the SKIL 6335-02 Corded Drill, you get the drill itself. It does not come with anything else; it doesn’t include screw bits, drill bits, or anything else of the sort. The drill is all you get here, which honestly, we don’t mind because we like purchasing accessories separately for the most part. All in all, the SKIL 6335-02 Corded Drill is a reliable drill. While it doesn’t have a bunch of features and accessories, it works just fine for most power drill applications. Like we have mentioned, this is a corded drill, so you don’t need to deal with working your project around battery duration. That being said, you will need a power source, plus probably an extension cord. In terms of power, the SKIL 6335-02 Corded Drill is pretty good. It features a 7-amp motor, which is pretty powerful considering what this drill is. It should be more than powerful enough to drill a hole or insert a screw into any kind of soft material, especially wood. In fact, this drill is built to be powerful, as is evidenced by the chuck that can handle ½ inch drill bits; this drill is designed to handle some fairly decent sized jobs. We really like the side assist handle which the SKIL 6335-02 Corded Drill comes with. It helps make drilling easier, more stable, and much more accurate too. This is a variable speed drill, which means that you can accurately control the speed at which you drill simply by pressing the trigger to different depths. The two finger lock button is pretty convenient too because it helps a lot more control to the equation. Other than that, there is really not much to say about the SKIL 6335-02 Corded Drill. This is probably the simplest drill to use that we have ever seen. Simply plug the SKIL 6335-02 Corded Drill into a power outlet, insert the drill bit of choice, and you are ready to rock. All you need to do is set the rotational direction and then pull the trigger to achieve the speed required for the job at hand. As we said, the SKIL 6335-02 Corded Drill is really simple to use and there is not much to it. 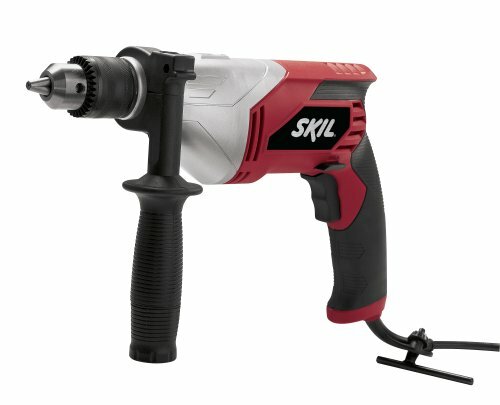 The SKIL 6335-02 Corded Drill is a really nice drill, but you might like a cordless one too. In that case, let’s take a quick look at the BLACK+DECKER GCO1200C Cordless Drill. This particular drill is a cordless one an impressive battery life, which is quite the bonus as far as we are concerned. Other than the battery power, there is not much difference between this drill and the SKIL. The SKIL does have a side handle for added accuracy, but other than that, both drills do the same things. Actually, the BLACK+DECKER GCO1200C Cordless Drill is a little bigger, chunkier, and heavier, which is something that might be important for you to consider. The SKIL 6335-02 Corded Drill might not be anything overly fancy and it doesn’t come with any accessories or a case, but it is a perfectly fine drill that gets the job done. It is powerful, it is reliable, and it works just fine. It is corded so you don’t need to worry about batteries, plus it means that you always get consistent power. It’s a fine all-around drill to consider purchasing.